La Repubblica Italiana è uno stato dell'Europa meridionale, che occupa gran parte della regione geografica italiana (o italica). L'Italia viene tradizionalmente chiamata la Penisola (in ragione della sua natura geografica prevalente) e lo Stivale (in virtù della sua caratteristica forma). La Repubblica Italiana, avente come capitale la città di Roma, confina con la Francia a ovest, con la Svizzera e l'Austria a nord e con la Slovenia a est; al suo interno sono presenti due microstati: San Marino e la Città del Vaticano. Fa parte della Repubblica anche il comune di Campione d'Italia, enclave nel territorio della Svizzera italiana. Die Italienische Republik ist eine Republik in Europa, die zum größten Teil auf einer vom Mittelmeer umschlossenen Halbinsel liegt. Italiens Hauptstadt ist Rom. Angrenzende Staaten sind Frankreich (488 km), die Schweiz (734,2 km), Österreich (430 km), Slowenien (232 km), sowie Kroatien (über eine Seegrenze), die Enklaven San Marino (39 km) und die Vatikanstadt (in Rom, 3 km). Zu Italien gehören die Mittelmeer-Inseln Sizilien, Sardinien und Elba. La République Italienne est un pays d'Europe méridionale. Située au centre de la mer Méditerranée, elle est isolée du reste du continent par le massif des Alpes. L'apport de l'Italie à la civilisation occidentale est immense : elle est notamment le berceau de l'Empire romain et de la Renaissance italienne. Existant en tant qu'État depuis la Réunification (1861), elle est aujourd'hui une démocratie parlementaire solide, membre fondateur de l'Union européenne. More images Italy - Italy (Category). This section holds a short summary of the history of the area of present-day Italy, illustrated with maps, including historical maps of former countries and empires that included present-day Italy. The Terramare culture (or "Terramara culture") is a Bronze Age archaeological culture of Italy and Dalmatia, dating to ca. 1500-1100 BC. It takes its name from the "black earth" (terremare) residue of settlement mounds. The Villanovan culture was the earliest Iron Age culture of central and northern Italy, abruptly following the Terramare culture and giving way in the 7th century BC to an increasingly orientalizing culture influenced by Greek traders, which was followed without a severe break by the Etruscan civilization. Villanovan cultural origins, but perhaps not all its peoples, lay in the Eastern Alps, with connections to the Halstatt culture. The Villanovans introduced iron-working to the Italian peninsula; they practiced cremation and buried the ashes of their dead in pottery urns of distinctive double-cone shape. The culture is broadly divided into a proto-Villanovan culture (Villanovan I) from 1100 BC to 900 BC and the Villanovan culture proper (Villanovan II) from 900 BC to 700 BC, when the Etruscan cities began to be founded. This map shows the Villanovan culture around 900 BC. At the end of the bronze age, the most important civilization was the Etruscan civilization, or in Etruscan Rasenna. As distinguished by its own language, the civilization endured from an unknown prehistoric time prior to the foundation of Rome until its complete assimilation to Italic Rome in the Roman Republic. At its maximum extent during the foundation period of Rome and the Roman kingdom, it flourished in three confederacies: of Etruria, of the Po valley with the eastern Alps, and of Latium and Campania. Rome was sited in Etruscan territory. There is considerable evidence that early Rome was dominated by Etruscans until the Romans sacked Veii in 396 BC. The preceding Iron Age Villanovan culture gave way in the seventh century to a culture that was influenced by Greek traders and Greek neighbors in Magna Graecia, the Hellenic civilization of southern Italy. The Etruscans are believed to have spoken a non-Indo-European language. Knowledge of their language is still far from complete. The mining and commerce of metal, especially copper and iron, led to an enrichment of the Etruscans and to the expansion of their influence in the Italian peninsula and the western Mediterranean sea. Here their interests collided with those of the Greeks, especially in the sixth century BCE, when Phoceans of Italy founded colonies along the coast of France, Catalonia and Corsica. This led the Etruscans to ally themselves with the Carthaginians, whose interests also collided with the Greeks. Around 540 BC, the Battle of Alalia led to a new distribution of power in the western Mediterranean Sea. Though the battle had no clear winner, Carthage managed to expand its sphere of influence at the expense of both the Etruscans and the Greeks, and Etruria saw itself relegated to the northern Tyrrhenian Sea. Since the first half of the fifth century, the new international political situation meant the beginning of the Etruscan decline. In 480 BCE, Etruria's ally Carthage was defeated by a coalition of Magna Graecia cities led by Syracuse. A few years later, in 474, Syracuse's tyrant Hiero defeated the Etruscans at the Battle of Cumae. Etruria's influence over the cities in the Latium and Campania weakened, and it was taken over by Romans and Samnites. 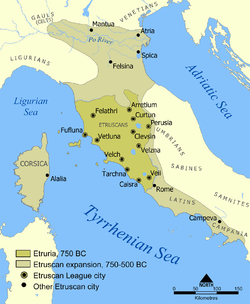 In the fourth century, Etruria saw a Gallic invasion end its influence over the Po valley and the Adriatic coast. Meanwhile, Rome had started annexing Etruscan cities. At the beginning of the 1st century BCE, Rome annexed all the Etruscan territory. In the north, the Ligures or Ligurians, an ancient people who gave their name to Liguria, which once stretched from Northern Italy into southern Gaul. The Ligures inhabited what now corresponds to Liguria, northern Tuscany, Piedmont, part of Emilia-Romagna, part of Lombardy, and parts of southeastern France. It is not known for certain whether they were a pre-Indo-European people akin to Iberians; a separate Indo-European branch with Italic and Celtic affinities; or even a branch of the Celts. Kinship between the Ligures and Lepontii has also been proposed. Another theory traces their origin to Betica (modern Andalusia). See for the spread of Celtic culture the two maps of Central Europe. More to the north, the Lepontii: The Lepontii were an ancient people occupying portions of Rhaetia (in modern Switzerland and Italy) in the Alps during the time of the Roman conquest of that territory. The Lepontii have been variously described as a Celtic, Ligurian, Raetian, and Germanic tribe. However, most evidence, including recent archeological excavations, and their association with the 'Golasecca culture' of Northern Italy, indicates a Celtic origin although they might actually be an amalgamation of Raetians (who were of Etruscan origin) and Celts. To the north-east: The Veneti were an ancient people who inhabited north-eastern Italy, in an area corresponding to the modern-day region of the Veneto. They spoke Venetic, an independent Indo-European language, which is attested in approximately 300 short inscriptions dating from 6th to 1st centuries BC. Venetic appears to share several similarities with Latin and the Italic languages, but also has some affinities with other IE languages, especially Germanic as well as Celtic. In the centre: The Latins were an ancient Italic people who migrated to central Italy, in the 2nd millennium B.C., maybe from the Adriatic East Coast and Balcanic Area, perhaps from pressures by Illyrian peoples. Although they lived in independent city-states, the Latins had a common language (Latin), common religious beliefs and a close sense of kinship, expressed in the myth that they were all descendants of Latinus, the father-in-law of Aeneas. The Latin cities extended common right to residence and trade to one another. One of these states was Rome. To the east: The Umbri are one of the oldest races of indigenous people in Italy. Most Umbrian cities were settled in the 9th - 4th centuries BC and were located on easily defendable hilltops. The region of Umbria is the land bordered by the Tiber and Nar rivers and the area covered by the Appennine slopes on the Adriatic. The Umbrian language is part of a group called Oscan-Umbrian which is related to Latin. More to the south: the Osci, were historic inhabitants of Southern Italy dwelling in Northern Campania and ultimately settling in the border region between Latium and Campania. They also competed with the Etruscans for possession over Campania. Later in the 5th century, the Samnites (Samnium), a warlike people who also spoke Oscan, took over the Oscan region and subjugated the Osci. To the south-east: The Messapii were an ancient tribe that inhabited the south-eastern peninsula or "heel" of Italy. They spoke the Messapian language. They are often referred to as "the most southerly of the Iapygian tribes". Finally the south was populated by ► Greeks. The region was named Magna Graecia. The small Italian state of the Roman Kingdom 753-510 BCE develops after 510 in the Roman Empire. The second map shows the territorial development of the Roman Empire, that at it height controls most of Southern and Western Europe, North Africa and West Asia. After 100 Germanic tribes gradually enter the area of the Roman Empire. This map shows invasions of the Roman Empire 100-500. In 395 the Roman Empire falls apart into the Western Roman Empire and the ► Eastern Roman Empire. A political map of Italy in 1796. A political map of Italy in 1810. After the collapse of the French rule and the Congress of Vienna, Italy is divided in several independent countries. This map shows the countries in 1859 before the unification (Kingdom of Sardinia, Papal States, Kingdom of the Two Sicilies, Grand Duchy of Tuscany with the duchies of Parma and Modena (green), the Lombard-Venetian Kingdom. The main of these countries was Sardinia. That kingdom was restored in 1814 and enlarged with the addition of the former Republic of Genoa. In 1850 a liberal ministry under Count Camillo Benso di Cavour was installed, and the Kingdom of Sardinia became the engine driving the Italian Unification. In 1859 Sardinia conquered Lombardy. In 1860 Parma, Tuscany, Modena and Romagna voted in referenda to join the Kingdom of Sardinia. The same year it acquired the Kingdom of the Two Sicilies. In 1861 the Kingdom of Italy was proclaimed thus ending the Kingdom of Sardinia as a separate kingdom.